On February 25th, 2015 we were beyond honored to perform at the House Of Blues in Boston, opening up the evening for Rick Springfield. This was part of Rick Springfield‘s “Stripped Down” Tour. It was an evening with Rick on acoustic guitar, telling stories and doing a Q n A with the audience. It was such a great show and evening. In the event you missed it there are some great Cell Phone videos from the night. Thanks to whomever filmed and uploaded, capturing a stripped down version of our own songs. Also, a huge Thanks to Rick Springfield for inviting us to play. 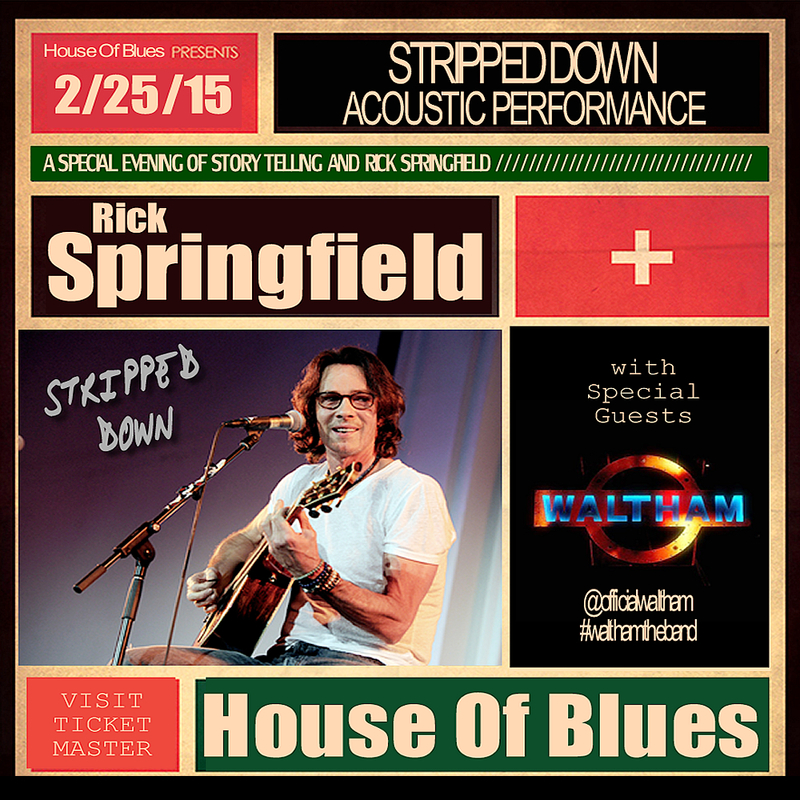 On February 25th, 2015 the Legendary RICK SPRINGFIELD will be at the HOUSE OF BLUES in Boston, MA. performing a Stripped Down Acoustic Set. We are beside ourselves excited to announce Rick invited WALTHAM to open up the evening for him. We will also be performing an acoustic set, something we never do. We are looking for forward to the show! Go to ticketmaster.com for more info on purchasing tickets. Check out the latest footage of WALTHAM rehearsing and sound checking the song “You’re Everything That I Want”. Edited and Filmed by Tim Dennesen of WET WAFFLE Productions.